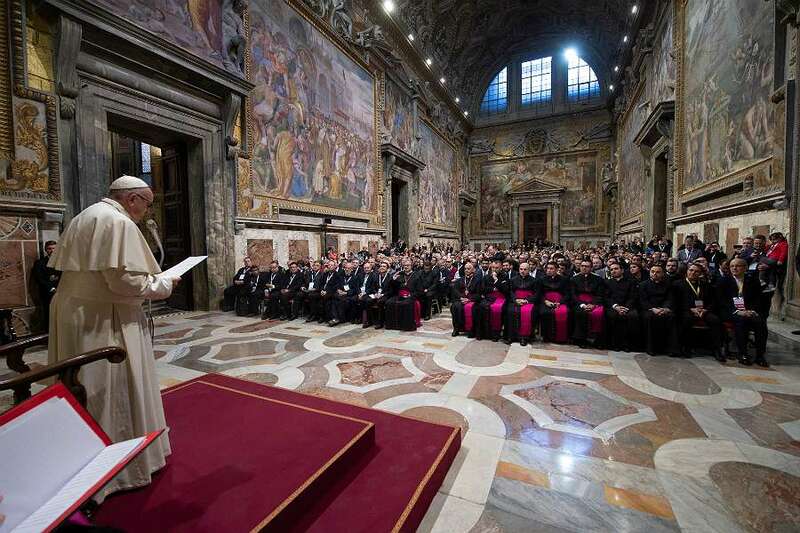 Vatican City (CNA/EWTN News)—Shrines and sanctuaries should be places of welcoming and mercy, where the sacraments can be received, Pope Francis said Thursday to an international gathering of shrine rectors and pastoral workers. 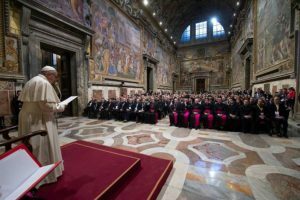 “In fact, when mercy is lived, it becomes a form of real evangelization because it transforms those who receive mercy into witnesses of mercy,” he said. Pope Francis also told the group he hopes each shrine has the presence of one or more “missionaries of mercy” to help with this evangelical work, and if it does not, that its representatives should ask the Pontifical Council for Promoting the New Evangelization to help. Missionaries of mercy are the approximately 1,000 priests from around the world Francis authorized during and after the 2016 Jubilee Year of Mercy to spread the message of God’s mercy and forgiveness, particularly through the sacrament of reconciliation. Pope Francis spoke to priests and lay people participating in an international convention on the daily work and operation of shrines. Held Nov. 27-29 at the Vatican, it brought together 586 participants from five continents. The group plans to hold similar conventions once every three years. The theme of the gathering was “The shrine: an open door to the new evangelization.” It took place following Pope Francis’ February 2017 decision to move the competency for shrines and sanctuaries to the Pontifical Council for Promoting the New Evangelization. Speaking to participants, Francis said shrines are irreplaceable because through catechesis and the “testimony of charity” they help sustain popular piety. Keep in mind, he said, that some people visit religious shrines for reasons other than piety or devotion—for example, because of local tradition, the art present, or the beautiful natural setting. He urged sanctuaries to celebrate the sacraments frequently because they are the universal prayers of the Church and to “nourish the prayer of the individual pilgrim in the silence of his heart” since many people visit a shrine wishing to receive a specific grace or the answer to a particular prayer. “With the words of the heart, with silence, with his formulas learned by heart as a child, with his gestures of piety . . . everyone must be able to be helped to express his personal prayer,” he said.